UIC, with the title “The railway to a greener life”, was held in Venice from 25 – 27 October 2012. On the first day the conference featured high-level speakers from the United Nations, the EU Commission, Italian Government and the European Parliament, along with senior leaders from the railway sector from all over the world and an audience of over 200 delegates to discuss the role of railways in achieving a sustainable future for the transport sector. Among them were Mr Mauro Moretti, CEO of Italian Railways and Vice-President of UIC, Mr Vladimir Yakunin, President of Russian Railways (RZD), Mr Marc Juhel from the World Bank, Mr Ralph Wahnschafft from the UN and Mr Keir Fitch from the European Commission. He reminded the audience of UIC’s mission statement: “To promote rail transport at world level and meet the challenges of mobility and sustainable development, using a systematic complementary approach: strategy, improvement and communication.” Then Mr Loubinoux announced that UIC has been invited to join a working group to prepare the UN Secretary General’s High Level Panel on Sustainable Transport. Mr Yakunin praised UIC’s role in promoting rail as a sustainable way to develop economies and meet the challenges of society, stressed the importance of the Declaration for Sustainability signed by 50 prominent railways and underlined RZD’s ambitions to modernise and improve its services, forming a link between markets and continents. The conference’s main topics addressed: railway development in the framework of the three pillars of sustainability, economic, social and environmental; the role of legislative framework in the development of sustainable railway transportation; rail and sustainable cities. On the second day, along with parallel sessions of the UIC Sustainability Networks, the RIVAS project held its mid-term conference. Funded within the 7th Framework Programme (FP7) of the European Commission, this project aims at reducing the environmental impact of ground-borne vibrations while safeguarding the commercial competitiveness of the railway sector. The conference took stock of the achieved research results and defined the way ahead. The third edition of the UIC Sustainability Awards was held at the 12th UIC Sustainability Conference. This initiative combines three innovative projects: Combined rail tickets and electric vehicle rentals; discounts for regular rail customers for high quality folding bicycles; and a train and car share initiative. These projects were developed to attract customers to rail while improving the sustainability of the door-to-door journey. This ambitious project assessed the biodiversity characteristics of Austrian railway infrastructure and highlighted areas of particular sensitivity and conflict. The project created an interactive mapping tool to better plan future infrastructure work with a minmum of environmental impact and to help promote and enhance biodiversity. Erex is a project that helps infrastructure managers and train operators reduce energy consumption and CO2 emissions, and save money by providing exact energy consumption data. The Erex system was developed by a non-profit organisation, Eress, jointly owned by its partners, Infrabel, Banedanmark, Jernbaneverket and Trafikverket. This project improved the energy efficiency of lighting in railway residential quarters in India. In total 1.41 million new low-energy light bulbs were installed. As well as delivering energy and CO2 savings, the project successfully leveraged the Clean Development Mechanism to support the project (the CDM is a global environmental investment and credit scheme developed by the United Nations). 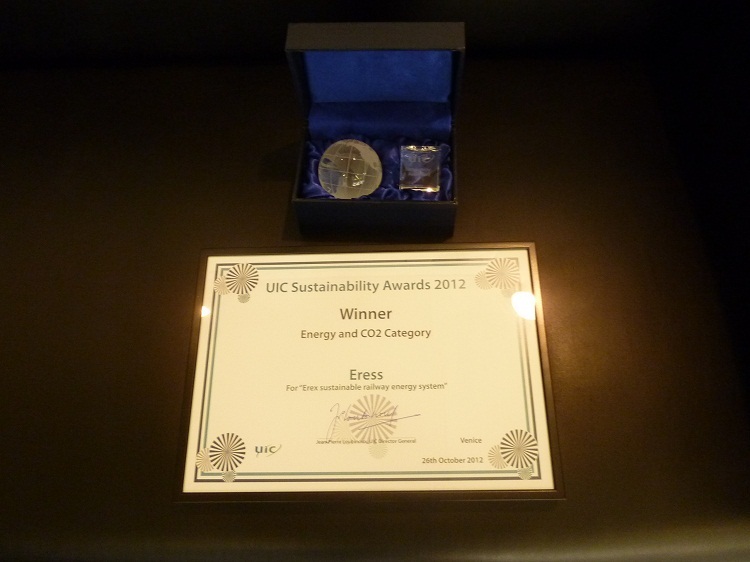 The UIC Sustainability Awards were introduced at the 10th UIC Sustainability Conference, which was held in London in September 2008. The aim of the Awards is to put the spotlight on and reward excellence to ground breaking projects and the significant efforts made within the rail sector to continuously improve its sustainability performance. The Clean Development Mechanism (CDM), defined in Article 12 of the Protocol, allows a country with an emission-reduction or emission-limitation commitment under the Kyoto Protocol (Annex B Party) to implement an emission-reduction project in developing countries. Such projects can earn saleable certified emission reduction (CER) credits, each equivalent to one tonne of CO2, which can be counted towards meeting Kyoto targets. The mechanism is seen by many as a trailblazer. It is the first global, environmental investment and credit scheme of its kind, providing a standardised emissions offset instrument, CERs. A CDM project activity might involve, for example, a rural electrification project using solar panels or the installation of more energy-efficient boilers. The mechanism stimulates sustainable development and emission reductions, while giving industrialised countries some flexibility in how they meet their emission reduction or limitation targets.